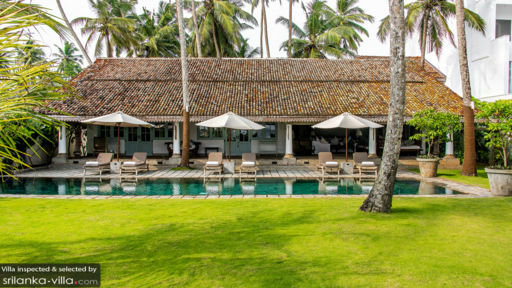 Villa Samudra in the historical city of Galle, Sri Lanka is a premier beachfront holiday home with a touch of Sri Lankan history embedded into its very walls. This two-bedroom paradise not only puts you in a prime location close to famous spots like Galle Fort and Yala National Park but also allows you to spend time in the peace and quiet of this particular area. The open-plan layout of the villa makes it airy and full of sunlight so you can make the most of your luscious surroundings even while indoors. Replete with modern amenities and verdant gardens, this is the ideal holiday home for couples, friends, and small families. Two beautiful bedrooms are found near the gardens at Villa Samudra Galle with mint-tone double doors leading to the corridor outside. Four-poster king-sized beds with uber comfortable mattresses are the perfect way to end your night guaranteeing a good night’s rest. Other furniture in these gorgeous, vintage-inspired spaces include a plush armchair in the corner, an antique cupboard, wardrobe and a writing desk. The bedrooms are air-conditioned so you can maintain the temperature as per your preferences. The hand-crafted wooden headboards, local textiles for bedding, unique lattice work are all part and parcel. En-suite bathrooms that are partially open-air are fitted with shower stalls, dual vanities, and other amenities. A beachfront location, the best part about Villa Samudra Galle is the direct path that takes you to the beach from the gardens. Apart from the crashing waves, guests can frolic in the water to their heart’s content even inside the villa as there is a 17-metre swimming pool laid out majestically amidst lush green gardens. The landscape is rich with tropical plants and trees, the birds chirping melodiously, and the fresh tropical breeze making you heady with fragrant aromas. Lounge on the deck chairs or head to the patio for a cup of tea as you enjoy the serenity. 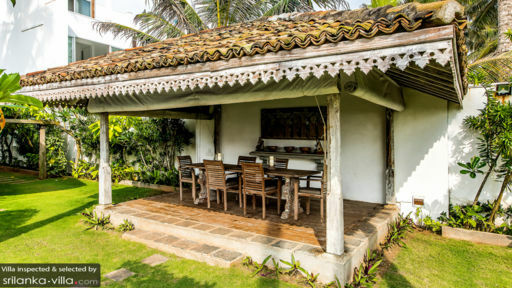 Villa Samudra Galle prides itself in offering guests a two-in-one deal where you have the best of nature and the most comfortable home to retreat to. 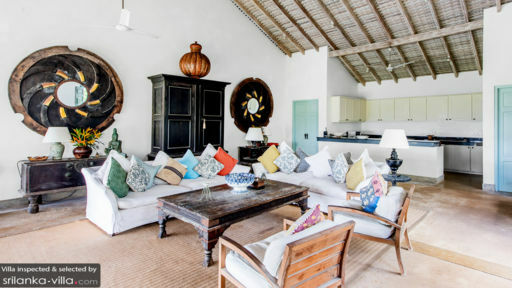 Open plan living areas are a boon in a tropical location like Sri Lanka where you can enjoy the fresh air as you kick back and relax on the comfortable sofas. The living area has been designed with a more traditional flair with antique, weathered-look cabinets, coffee table, and arched doorways. The double doors and open-sided areas promise a well-ventilated space. Perpendicular to the living area facing the swimming pool sits the alfresco dining area at the villa with a picture-perfect setting to serve as your backdrop. There is a six-seater rustic dining table under a traditional, high ceilinged pavilion with a fan to keep it cool. A fully-equipped kitchen forms part of the living area, fitted with necessary appliances and amenities for your use. A fully staffed villa means a definite good time and at Villa Samudra Galle the housekeeping staff, management, security, and other members take care of everything for you. They even extend special services to guests including massages, boat or car rentals, airport transfers, a personal chef only at an extra cost. There is a lot to do and see in and around Galle including a visit to the historical Galle Fort which is a UNESCO World Heritage Site. You can arrange a trip to Yala National Park to explore the wildlife of Sri Lanka or head to the beach for fun water sports. We really loved it and thought the villa brilliant The staff were exceptional and they provided the best teamwork of any of the houses we have stayed in in SL.Nothing was too much trouble and you did not have to tell them anything twice.Once we sorted out the problem of my best red wine going in the fridge everything was fine! The food was really good and for once in Ruan we had a chef who was able to cook what he said he could,quite unusual. We are definitely coming back next February !